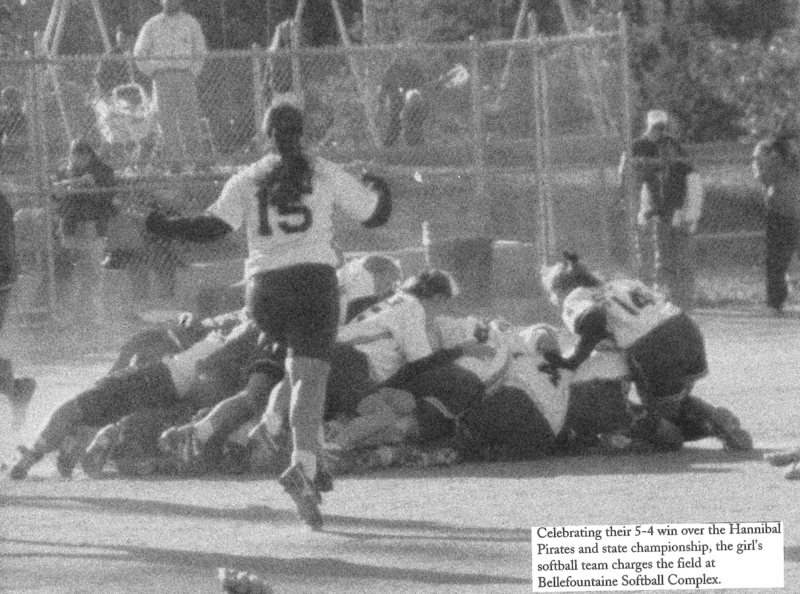 The softball team took home the state title for South in 1996. Where has South's sporting success gone? Holding up a state championship trophy with your Parkway South team. This is a feeling very few Parkway South students have ever had… why? On Dec. 2 the varsity cheerleading team won the state championship. This is an achievement that deserves to be celebrated. Before this, Parkway South had not won a team state championship in 17 years. As a well-funded school with more than 1,700 students attending every year, what is stopping us from winning more state titles? More importantly, what are we missing out on? Math teacher Andi Seavey knows exactly what students are missing. A South graduate, she played all 9 positions for the state championship-winning 1989 Patriot team. She commented on what it was like to win a state championship for South. “Winning a state championship my junior year was easily my defining moment in high school. It was great to celebrate with the players, coaches, and school, all our hard work had paid off,” Seavey said. Seavey said she still has vivid memories of the championship run that year, which culminated in a final weekend of games that determined whether the Patriots would go home or make history. “Our semifinal game was on a Friday night at Valley Park. The football team also had a game that night, but the football coach at the time cancelled the football game, so that more students could come and support us,” Seavey said. Current generations of students could learn a thing or two from what Seavey said happened next. “There were over 1,000 people in attendance, between the parents and students. It was a magical atmosphere,” she said. With everything on the line, the support of the fans pushed the South team to victory in a close game over rivals Valley Park. “After the win, the students at the game rushed the field. It was a fantastic moment to share the win with the students who came to support us; it was something I’ll never forget,” Seavey said. The next day, Parkway South beat Hannibal 9-6 in the state championship game, cementing the 1989 team’s Parkway South legacy forever. “The support at all sports events was much higher when I was a student,” Seavey said. The Patriot softball team wasn’t done there. The team also took state titles in 1991 and 1995. The softball team wasn’t the only dominant Patriot team at this time, as Parkway South took many state titles from 1985-2001. During this era, Parkway South won 9 team state titles, and had countless top 3 finishes. Perhaps the most dominant sport we’ve had at this school is the boys swimming team, which took home the state championship three years in a row from 1999-2001. How could be we be so dominant over a 15-year span, then in the next 15 years have such a lack of team success? Currently, with less and less support for our teams, it is hard for those who do get involved in sports to feel motivated and take pride in playing Parkway South sports. I know that we’ve had several individual state titles recently, but I am focusing on the team titles, because, in my opinion, winning state as a team representing Parkway South can really unify a school. For example, we all know of 2018 graduate Carson Haskins’ remarkable accomplishments on the tennis court–we all know he won the state title four years in a row. But how many students watched him play his matches? How many students actually traveled to Springfield each year to watch him in the state tournament? I’m betting not many. Our lack of state championships is not the fault of our coaches or athletes, but the community as a whole. Our lack of school spirit, involvement, and turnout at sporting events makes us less likely to have success in sports, like we enjoyed in the past. At Parkway South, years of limited athletic success has led to a culture where less students are getting involved, and many students don’t feel a drive to compete athletically. It has become a vicious cycle that is only getting worse, and it is up to students to make a change. state championships over the years. Because of our lack of school spirit, I feel Parkway South has not even come close to its athletic potential. If more students were to get involved in athletics and take pride in our school, I believe Parkway South could see many more team state trophies in the future.